© 2017 John Wiley & Sons Ltd. 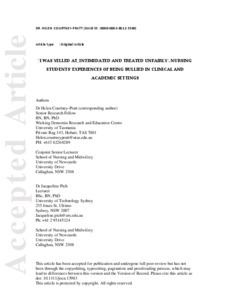 This is the peer reviewed version of the following article: Courtney-Pratt, H and Pich, J and Levett-Jones, T and Moxey, A, 'I was yelled at, intimidated and treated unfairly': nursing students' experiences of being bullied in clinical and academic settings, Journal of Clinical Nursing, 27, (5-6) pp. e903-e912., which has been published in final form at http://dx.doi.org/10.1111/jocn.13983. This article may be used for non-commercial purposes in accordance with Wiley Terms and Conditions for Use of Self-Archived Versions. Aim: To present findings from a study that explored nursing students’ experiences of bullying in clinical and academic settings, the strategies used to negotiate bullying, and recommendations for empowering future students. Background: Nursing students are identified as a group who are at particular risk of bullying. Numerous studies have examined students’ experiences of bullying in clinical contexts by qualified nurses, however, there has been far less attention to the bullying that occurs in academic settings where the perpetrators are university staff and other students. Design: The qualitative findings presented in this paper form one component of a mixed methods, multi-site study that examined the nature and extent of bullying in one cohort of nursing students. Methods: A convenience sample of 29 first, second and third year undergraduate nursing students from one semi-metropolitan Australian university was recruited for semistructured interviews in 2014. Interview data was analysed using NVivo. Findings: Participants described multiple examples of bullying occurring in both clinical and academic settings. Perpetrators included clinicians, facilitators, academics and fellow students. Bullying ranged from incivility to physical attacks. The impact of the bullying was profound; it caused many of the participants to feel anxious and distressed, it undermined their confidence and perception of competence, and often led them to question their career choice. Strategies described by participants to cope with or manage the bullying included avoidance, trying to ‘just survive’, and seeking support from trusted academic staff, family and friends. No episodes of bullying were formally reported. Conclusion: Bullying remains a pervasive phenomenon occurring in both clinical and academic settings. Students are, in many respects, a vulnerable and disempowered population who often fear the consequences of making a formal complaint. Thus, reporting structures and support strategies need to be re-examined, and resilience training is imperative.